I was alone on the elevated train when the gang of teenage boys burst in. The city’s economic crash had affected me body and soul. I was a newlywed and naively expected happiness to radiate into every corner of my life. But every morning I’d awaken as if pinned under a heavy weight, conscious of my continuing unemployment after six months of searching, unsure of myself and my future as a recently graduated English major. Those days, even entry-level typing jobs in publishing were scarce, and I was beginning to despair. When I entered the empty last car that day, heading towards Manhattan for a job interview, I was wearing black patent leather shoes, a tweed coat and a brimmed felt hat — prim, proper and wildly conspicuous. “Never show fear,” my older brother Bob used to say, advice I thought ridiculous as a girl because of its irrelevance to my life. Now I heard him urgently whispering those words in my ear as the teens rushed en masse to the opposite end of the car. They were spray-painting every inch of wall, working with purposeful efficiency and what seemed like quiet glee, moving closer to me foot by foot. And so my internal debate went, what I think of as my “to be or not to be” musings. I wasn’t ready to shuffle off the mortal coil just yet, but I simply couldn’t act. And so I remained rooted to my seat, pretending to be interested only in my book. Later I recognized the irony in what I was reading: Do It! Scenarios of the Revolution by political provocateur Jerry Rubin. Of course I’d stopped registering meaning the moment the teens entered, for I had suddenly become an unwilling character in an unexpected story, maybe a horror story involving knives and a young victim’s blood gushing over her Sunday-best coat. I raised the paperback closer to my face, hoping to disappear. Every few minutes, the train stopped and its doors opened, giving me hope that someone would enter. But my attempts to influence behavior with telepathy failed. Anyone who stood on the platform quickly sized up the situation and, wanting no part of it, stepped into the adjoining car instead. The smell of spray paint was getting stronger. I peeked furtively over the top of Do It! and saw the aerosol-armed teens were within a few yards. Then one of the boys, who looked all of 15, approached me. “This is it,” I thought, my heart pounding as if being played by a deranged drummer. My last moment on earth. I wished I’d never been asked to interview for the editorial assistant job that day, I wished I was back in bed, safe under my blankets of steel. But when he pointed with his paint can to the wall behind my seat, I knew with a flood of relief that he meant me no harm. Hunching, I bent my head low so that he could spray his tag without interference. At the next station, job done, they all piled out. My siege of terror was over. During what had felt like an hour but was probably ten minutes, no one had uttered a word to me. After my breathing returned to normal and the car gradually filled with other passengers, I felt a bit sheepish for having thought my life was at stake, but not sheepish to the point of self-flagellation — after all, not one person had the nerve to enter the last car, stop after stop. Already I could hear myself dramatically recounting to rapt friends the story of my close call. Ultimately, what only mattered to those teenagers was using graffiti to claim the car for themselves. During those grim days, graffiti was a visual symbol of social anarchy and urban blight. To spend time in an enclosed space like a subway car covered with spray paint and black marker was to experience the deeply unsettling feeling of being trapped in a netherworld. That atmosphere did little to lift me from the gloom and fright of my joblessness and my eroding confidence in myself and a rational, orderly world. Today, some graffiti is readily called art and is even produced on commission for public parks or for landlords who recognize its appeal to certain buyers on the sides of their condo buildings. But back then, authorities were waging a war on graffiti that young men —– for the graffiti subculture was almost exclusively male — found ways to circumvent, even venturing into dangerous tunnels. In graffiti vernacular, the mission was always to write their tags, never their own names, but an alias chosen for personal meaning as a way to assert a new identity. Often during my interminable job hunt as I filled out applications, I sighed silently as I signed my name. I too wanted a new self, the successful self I felt I was meant to be because the self I knew wasn’t getting anywhere. It’s taken years for me to answer “writer” when someone asks me what I do, despite the many times that I added my name to a poem or essay. These teenagers called themselves writers from the start, asserting their right to be through the pen names they took on, but writ large from a spray can instead of a pen. Like the rest of us, they were probably trying to beat the odds of insignificance, of going unnoticed and being forgotten, of nothingness itself. From the tunnel of my memory, I’m pulled back to the dungeons of the Doge’s Palace in Venice, across the appropriately named Bridge of Sighs, and the names that the condemned had scratched or written on the walls, a final act against the looming void. It strikes me that despite their crimes, real or fabricated by enemies (a frequent occurrence in 16th century Venice), the graffiti writers Marco, Giuseppe and Antonio have achieved a poignant recognition. Even now, still legible after four centuries, their names have the power to unsettle and move the viewer. I stared at them for minutes, imagining the desperate need of those men to declare their very being. Thinking about my slow progression through the low-ceilinged, dank and twisting corridor of that prison and the inhuman conditions the inmates endured, I return to the New York City subway and the depressed era of that ride. Besides the stories of vicious street gangs, I also recall many newspaper and TV exposés about crumbling South Bronx tenements and vermin-filled apartments without heat or hot water along that same elevated train route. I knew these horrors existed less than three miles from where my husband and I lived. Our dark apartment near the noisy el train faced an alley, but was located in what was considered a safe Bronx neighborhood. 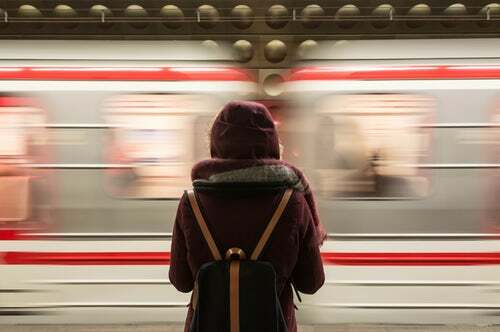 Despite my near-desperation over being jobless for so long, I knew I would never descend into poverty, and that whenever I traveled on that train through the devastation, I was just passing through. My interview that day didn’t lead to employment. Eventually, I had a lucky break and landed an editorial job, low paying but providing the career experience I needed for the next job up the ladder. The words dead end, which had begun to turn up in my mind like hangmen in waiting, suddenly vanished. Recently I’ve been wondering about those boys in the last car. Were any of them highly talented, aspiring artists who planned their designs before sneaking into subway yards at night to sign across the car exteriors? Sometimes the multicolored, baroque swirls of names across the entire length of a train had a startling beauty that stopped me in my rush to board. Being only 21 years old myself, I could feel the exuberance, the youthful declaration of the “I,” the “yes!” defying all the “no’s” that the writers probably faced elsewhere in their lives. Painted over at first, by now all of that graffiti, the ugly and the beautiful alike, has been crushed and scrapped. I can’t help wondering about the men those boys have since become, and how else they’ve left their mark. Did they try out other identities and, like me, run into some luck on the ride? Maria Terrone’s nonfiction has appeared in such journals as Witness, Green Mountains Review, The Common, Briar Cliff Review, Potomac Review, The Evansville Review and Litro (U.K.). At Home in the New World (Bordighera Press), her first essay collection, publishes in fall 2018. Also a Pushcart-nominated poet, she is the author of Eye to Eye; A Secret Room in Fall (McGovern Prize, Ashland Poetry Press); The Bodies We Were Loaned, and a chapbook, American Gothic, Take 2. www.mariaterrone.com.